We’re happy to announce that the Toyota Highlander is now for sale around Indianapolis, Indiana – right here at Andy Mohr Toyota. Keep reading (or contact us) to learn more about buying or leasing this SUV. Here at Andy Mohr Toyota, we’ve turned the process of buying or leasing a new or used Highlander into a fun and exciting experience. If you’d like to initiate this process soon, all you need to do is get in touch with us. Once we hear from you, there are two processes that we’ll begin immediately. First, we’ll set you up with an exclusive Toyota test drive. That way, you can experience all of this SUV’s engine power, performance prowess, and entertainment tech for yourself. You could test it out today! Next, we’ll put you in the hands of our team of financial wizards. At our finance center, they’ll reach out to our network of banks and lenders around Indianapolis to come up with a plan that makes sense for your lifestyle. They want to help meet your needs, achieve your goals, and maintain your finances. Toyota Highlander LE: Toyota Safety Sense™ P (TSS-P), Seating for eight, Integrated Backup Camera, etc. 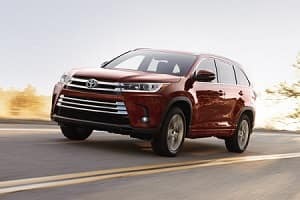 Three Hybrid Versions: If hybrid fuel efficiency is your thing, pick between the 2018 Toyota Highlander Hybrid LE, the 2018 Toyota Highlander Hybrid XLE, and the 2018 Toyota Highlander Hybrid Limited. Of course, depending on which trim level you choose, you could deck it out in either Midnight Black, Blizzard Pearl, Celestial Silver, Predawn Gray, Salsa Red, Ooh La La Rouge, Toasted Walnut, Alumina Jade, or Shoreline Blue. Contact us to discover which models and colors we have in stock right now. At the end of the day…why buy from us? 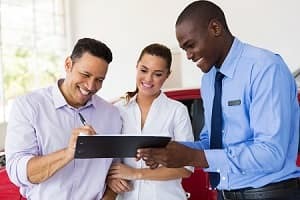 To learn more about our dealership’s philosophy, drop us a line at your convenience. We’d love to talk! We’re near Indianapolis, and we’re excited to help you drive away in your next dream car. What are you waiting for? Test drive the Toyota Highlander as soon as possible at Andy Mohr Toyota.